That's a great way to not only make a pretty and fun card but to clean off your desk at the same time! Cute card with that precious kitty image. This is gorgeous, I do love this Kitty. A beautiful card. I am loving your new header to your blog too! Nice and cheerful with a gorgeous kitty. Have a wonderful weekend my friend. 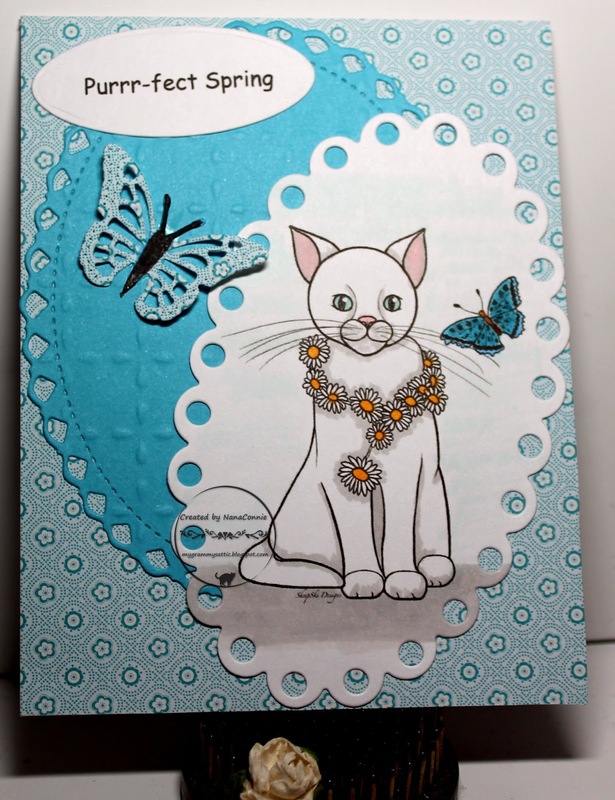 Puuurfect spring card and awesome creativity with the things left on your "messy desk!" Such a beautiful card and gorgeous image! Thank you for sharing with us at Creative Inspirations, good luck and I hope you will join us again. LOVE it, a Super card with lovely dies and colouring and a GREAT story on how you made it too LOL. Great cat image! Love the dies you used too! How fabulous - I love the offset ovals and the kitty is so sweet. Very cute!! I've given myself a challenge of using up my bits and pieces stash this year, so your self-imposed challenge to create a card using items already on your desk makes me smile. : ) I worked out quite well for you, I think! Thanks for playing with The House That Stamps Built. Such a cute card, love the adorable image, such a pretty card.